If you’ve ever gone through a physical therapy session with any of our therapists, you know they are some of the best. Now, we have the technical measurements to prove it. Mid-Tennessee Bone and Joint’s physical therapy department was recognized as having higher functional outcomes than the national average over hundreds of other physical therapy departments across the country. A functional outcome is measured by how quickly the patient returns to their regular activity levels prior to injury or surgery with the help of therapy. If two identical patients are compared – one having gone through therapy at MTBJ and another patient who went to therapy at a different location – there is a much better chance of our patient completing therapy in a shorter amount of time and also returning to normal activity levels faster. Each body part has its own type of assessment tools to gauge how well flexibility, range of motion, and strength has increased since beginning therapy. Our therapists meet with each patient on the first visit to discuss medical history, what type of injury or surgery they had, and what goals they want to achieve. Clinic Director Ashley Miller says that all patients come in with different objectives, but it all comes back to the patient wanting to do their favorite activities like before with no pain. Our therapists’ main goal is to return the patient to whatever is considered normal activity levels for that patient. While a patient is in our care, we formally evaluate progress every 30 days. This is to compare how the patient perceives their progress versus the results from our professional assessment tools. Ashley says that many times, the physical therapists can see progress at each visit. Motivation is easier to achieve when that progress is happening on a regular basis. This shows the patients that their hard work is paying off. Our staff works hard every day to provide the best treatment plans possible for our patients. 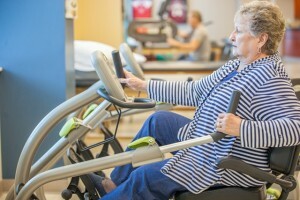 The therapists provide the techniques and encouragement, and the patients put in the hard work necessary to get back to normal as soon as possible. Read more about our Physical Therapy department! One Response to "Physical Therapy Department Recognized for Helping Patients Rehab Faster"